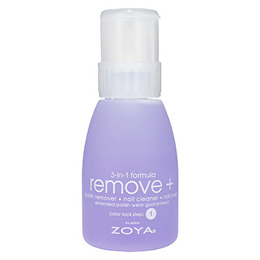 Zoya Remove Plus is packaged in the portable, spillproof 8oz Big Flipper pump container. 2-Propanone, Water ( Aqua), Glycerine, Fragrance, D&C Violet. Press a saturated nail wipe on the nail a few seconds to soften nail lacquer, and wipe clean. Repeat prior to applying base coat. Below are reviews of Zoya Remove Plus - Nail Polish Remover - 237ml by bodykind customers. If you have tried this product we'd love to hear what you think so please leave a review. Have been using this for years and wouldn't use anything else! Gentle and effective. Brilliant nail polish remover. No scrubbing, effortlessly and effectively takes off polish and doesn't dry nails. I've tried many removers in my time but this surpasses all of them. Definitely the best remover I've used and I've been painting my nails for over 40 years! It's gentle on nails and skin but very effective. I've been using it for a few years now and recommend it highly. I agree with other reviewers and I won't use any other remover now. It is so gentle on the nails and cuticles but is very effective, plus the smell isn't too strong. I love this product and have used this for a few years now. Bodykind are also the best price so it's easy to get with any supplements I am buying. Won't use anything else! I first tried this a few years ago, now i won't use anything else. This is the best Nail Polish Remover Ever! Cuts through and removes nail polish quickly and effortlessly. Excellent nail varnish remover with a fairly pleasant smell (for nail varnish remover anyway). Easy to use pump top, just put a cottonwood pad on the top and press down a couple of times. Top can then be put in a lock position when not in use. Leaves nails in good condition and works well at removing strong colours and even glitter varnish.